The incredible new way to mix, bake and serve perfect brownies! 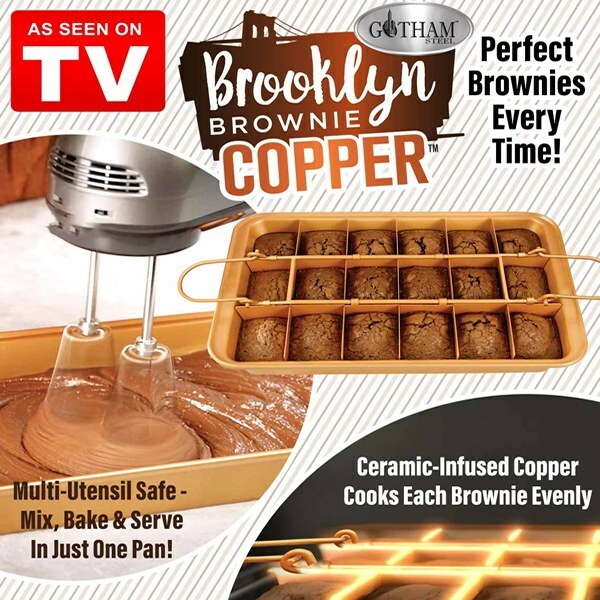 Brooklyn Brownie Copper Pan lets you mix, bake and serve amazing party foods everyone will love! As seen on TV Brooklyn Brownie Copper Pan combines nonstick, super strong surface with the convenience of a self-slicing pan. Easy to use just pour your batter into pan or mix it right in the pan, insert the brownie grid, and slide it into the oven. When cooking, the even heat distribution provided by the pan&apos;s bottom, sides, and grid promise to deliver crispy edges and gooey centers in every square. When done remove the grid for 18 mini brownies. And the bottom of the pan even lifts out to create the perfect serving plate. From there, each brownie promises to easily pop out one-by-one due to Brooklyn&apos;s non-stick, super strong, PFOA-free surface. This also means you won&apos;t need any extra oil or butter. Oven safe up to 500 degrees F. It&apos;s the perfect baking pan. Ideal for brownies, pizza, appetizers and so much more. PFOA free, Dishwasher safe. The only way to go!!!! Now my grandkids can&apos;t dog the brownies! They use to make great big pieces and the little ones only eat what was left. Now they all get the same size.